Celestron Dual Axis Motor Drive tracks in RA, allows movement in DEC and is specially designed for the mounts of Celestron Omni telescopes. The Celestron tracking motors allow you to easily follow celestial objects with your telescope. Especially when you are into astrophotography, a motor drive is a must. The motor is powered by a 12V power supply cable which is capable of driving the motor at 4 different speeds. The motor drive is incredibly precise and tracking celestial objects is very easy provided the object is well-centered in your field of view. The Celestron Dual Axis Motor Drive for Omni telescopes can be easily connected to the Celestron CG-4 mount. 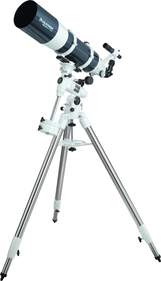 This mount comes standard with all Celestron Omni telescopes. The motor drive comes with an extensive manual detailing how the motor drive is to be installed. Write a review By sharing your experience with the Celestron Dual Axis Motor Drive, you can help others (perhaps still doubting customers) with making a good choice.